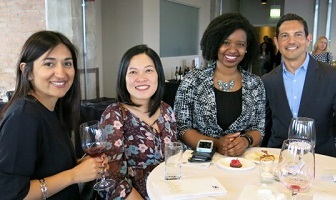 Chicago Bar Foundation’s Passport to Chicago on April 28 – Don’t Miss it! Access to justice never tasted so good! On Friday, April 28, Chicago’s legal and culinary communities will come together for the fourth annual Passport to Chicago event in support of The Chicago Bar Foundation. Guests will enjoy dishes representing Chicago’s rich and diverse neighborhood landscape, conceived and prepared by members of the Kendall College Competition Club. Tasty treats, local libations, and captivating conversation will be the highlights of an evening whose culmination will see the two top chefs awarded culinary scholarships. In addition, Passport to Chicago will place the spotlight on various CBF-supported organizations throughout the city. Through grants, legislative advocacy, work in the Courts, and other programs and partnerships, The Chicago Bar Foundations works tirelessly to improve access to justice for many low-income and disadvantaged people, including domestic violence victims, people at risk of losing their homes, and immigrants fleeing abuse. Providing grants to more than 30 pro bono and legal aid organizations each year, tens of thousands of low-income Cook County residents will receive the help they need as a result of the CBF grants program. The organizations highlighted at this year’s event will include Equip for Equality, Legal Council for Health Justice, Indo-American Center, and many others. The event’s co-chairs, Jeanne Doran (LexisNexis) and Nancy Roberts Linder (Linder Legal Staffing Inc.), are joined by members of the CBF’s Young Professionals Board in planning this year’s event, which will give guests and a panel of local celebrity chefs the opportunity to vote for the scholarship winners. Passport to Chicago will be held at Kendall College (900 N. North Branch St.) from 5:30 p.m. – 8:00 p.m. Individual tickets are $100 and can be purchased here. See you on April 28!